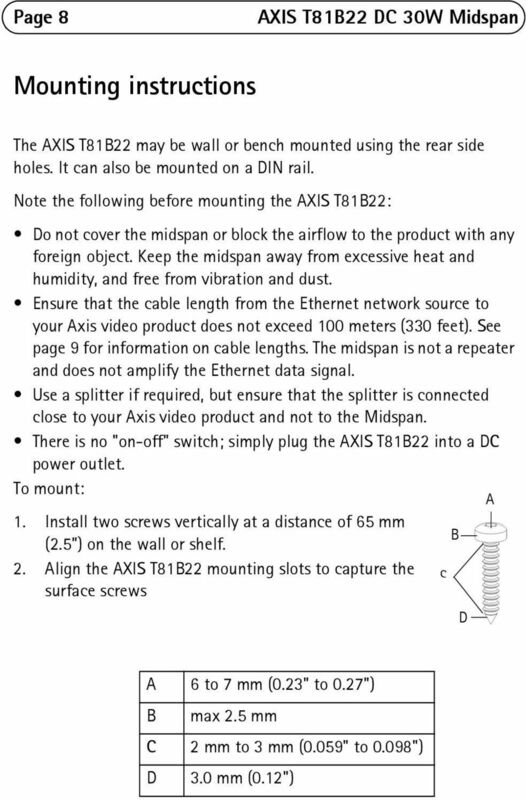 Download "AXIS T81B22 DC 30W Midspan"
3 Safeguards Please read through this Installation Guide carefully before installing the product. 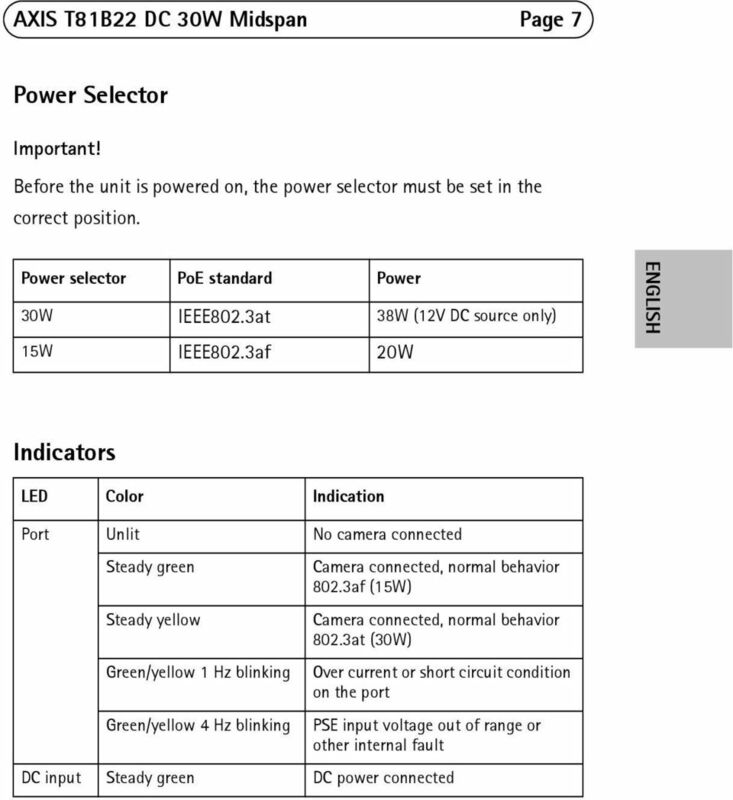 Keep the Installation Guide for further reference. Caution! Store the Axis product in a dry and ventilated environment. Use only accessories that comply with technical specification of the product. These can be provided by Axis or a third party. 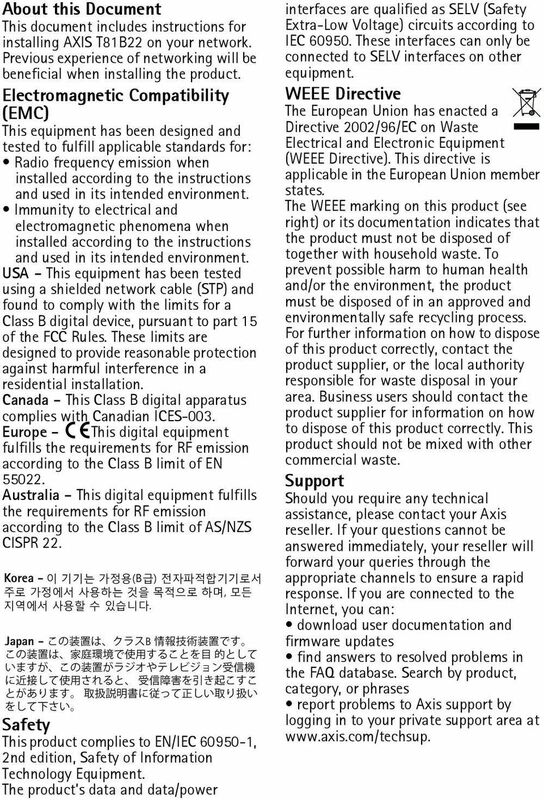 Do not attempt to repair the product by yourself, contact Axis or your Axis reseller for service matters. IMPORTANT! This product is intended for indoor use. DC Power Cable Set - the power cable must be rated for a minimum current capacity of 3 amps (minimum 0.5mm2, AWG24). Use a limited power source, such as a mains adaptor, with rated power output not exceeding either 100 W or 5 A. The DC power source must be near the AXIS Midspan and easily accessible. 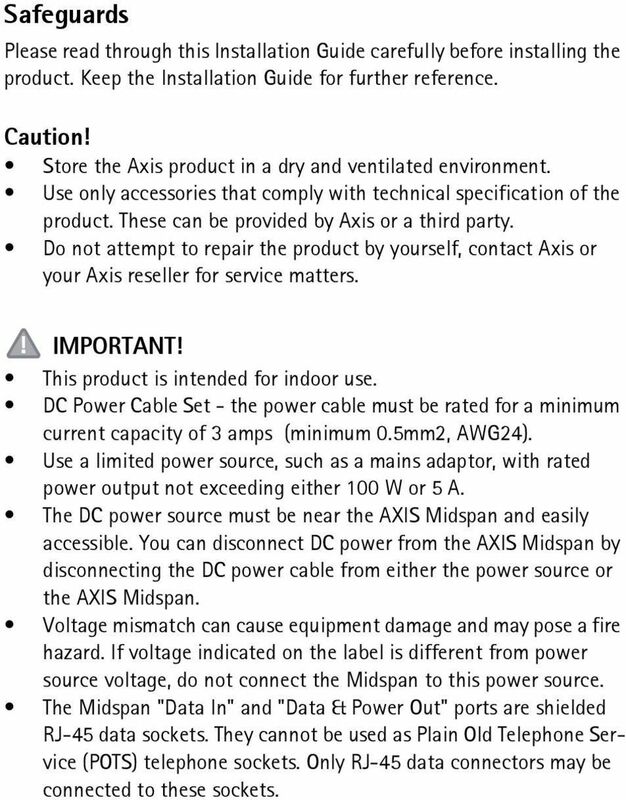 You can disconnect DC power from the AXIS Midspan by disconnecting the DC power cable from either the power source or the AXIS Midspan. Voltage mismatch can cause equipment damage and may pose a fire hazard. If voltage indicated on the label is different from power source voltage, do not connect the Midspan to this power source. The Midspan "Data In" and "Data & Power Out" ports are shielded RJ-45 data sockets. They cannot be used as Plain Old Telephone Service (POTS) telephone sockets. Only RJ-45 data connectors may be connected to these sockets. 4 Liability Every care has been taken in the preparation of this document. Please inform your local Axis office of any inaccuracies or omissions. Axis Communications AB cannot be held responsible for any technical or typographical errors and reserves the right to make changes to the product and documentation without prior notice. 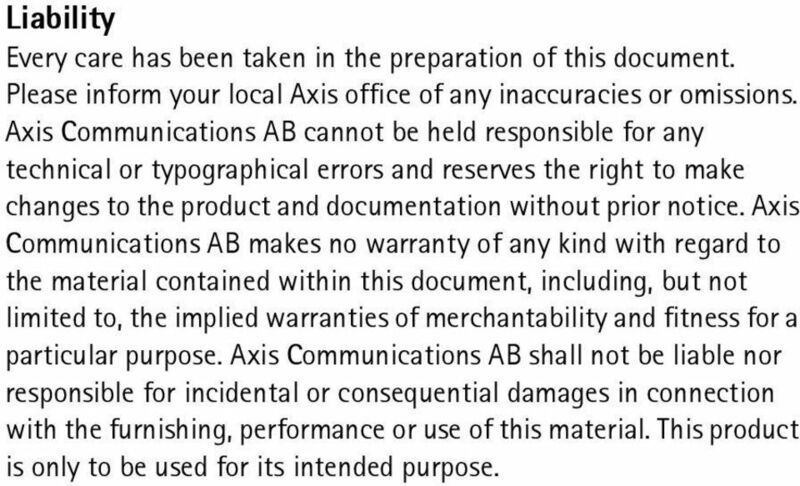 Axis Communications AB makes no warranty of any kind with regard to the material contained within this document, including, but not limited to, the implied warranties of merchantability and fitness for a particular purpose. 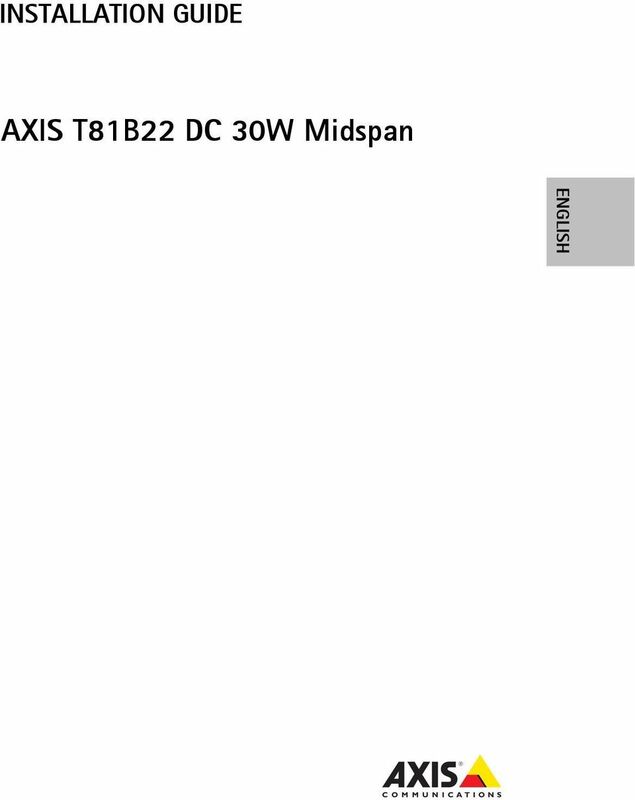 Axis Communications AB shall not be liable nor responsible for incidental or consequential damages in connection with the furnishing, performance or use of this material. This product is only to be used for its intended purpose. 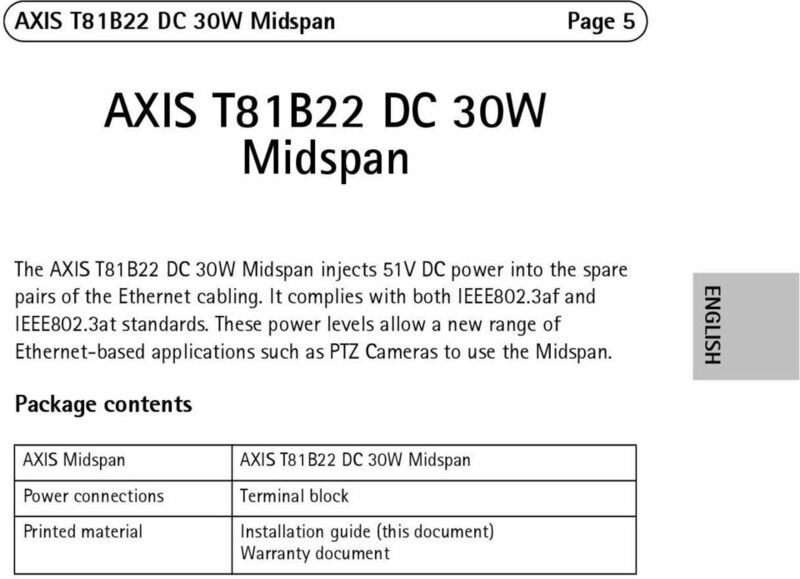 10 Page 10 AXIS T81B22 DC 30W Midspan Troubleshooting Symptom Midspan does not power up A port indicator is not lit and the PD (powered device) does not operate The end device operates, but there is no data link Corrective steps 1. Verify that the voltage at the power inlet is either 12V DC or 24V DC for Input voltage. 2. Remove and re-apply power to the device and check the LED indicators during power up sequence. 1. 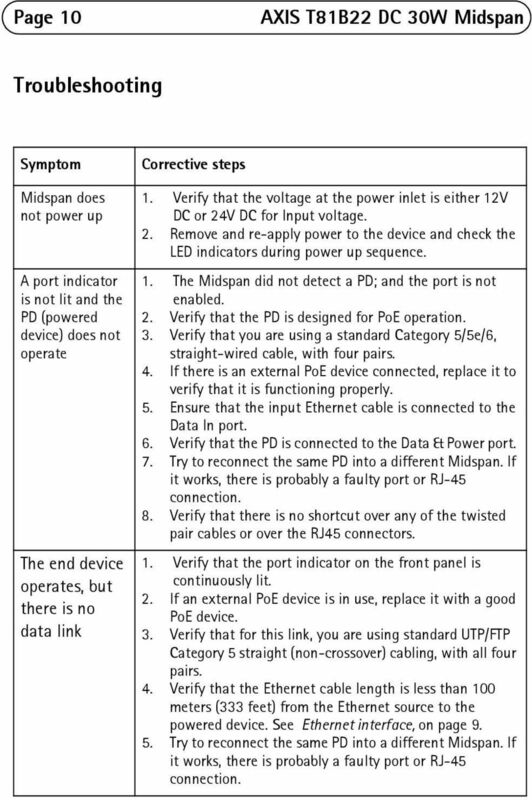 The Midspan did not detect a PD; and the port is not enabled. 2. Verify that the PD is designed for PoE operation. 3. 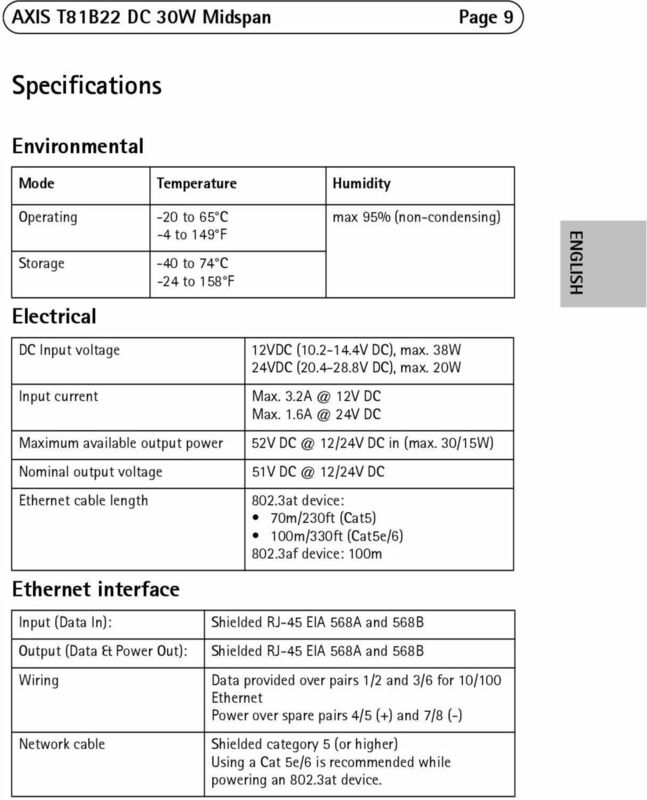 Verify that you are using a standard Category 5/5e/6, straight-wired cable, with four pairs. 4. If there is an external PoE device connected, replace it to verify that it is functioning properly. 5. Ensure that the input Ethernet cable is connected to the Data In port. 6. Verify that the PD is connected to the Data & Power port. 7. Try to reconnect the same PD into a different Midspan. If it works, there is probably a faulty port or RJ-45 connection. 8. Verify that there is no shortcut over any of the twisted pair cables or over the RJ45 connectors. 1. Verify that the port indicator on the front panel is continuously lit. 2. If an external PoE device is in use, replace it with a good PoE device. 3. Verify that for this link, you are using standard UTP/FTP Category 5 straight (non-crossover) cabling, with all four pairs. 4. Verify that the Ethernet cable length is less than 100 meters (333 feet) from the Ethernet source to the powered device. See Ethernet interface, on page Try to reconnect the same PD into a different Midspan. If it works, there is probably a faulty port or RJ-45 connection. Building Air Conditioning Control System Power supply unit Model: PAC-SC50KUA Installation Manual Contents 1. Safety precautions... 1 2. Product feature... 2 1. Specification... 2 2. Appearance... 2 3. Dear Customer! Thank you for choosing our product. Quick Install Guide. XAP-1032 Luxul Xen Commercial Grade Dual Directional b/g/n Wireless Access Point. luxul.com. 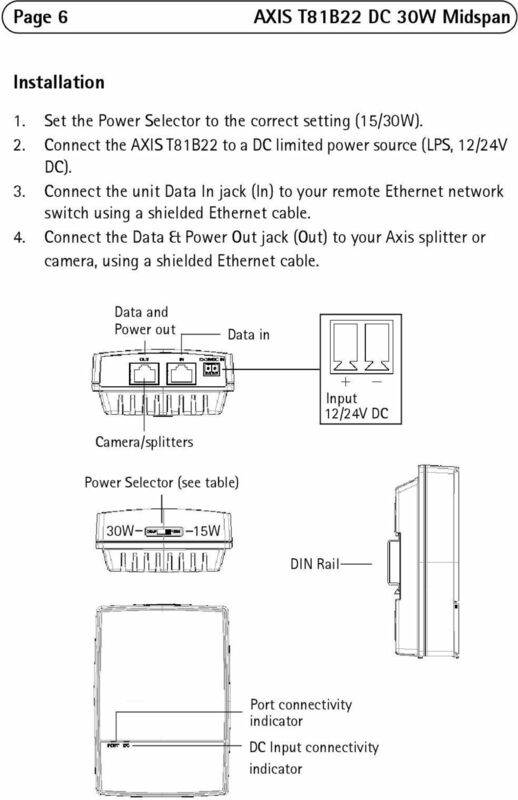 Installation and Operating instructions for DVI/USB extension C9900-A172/ -A173/ -A174 for CP68xx and CP78xx Control Panels Version: 1.2 Date: 2007-08-15 Table of contents Table of contents 1. 2. 3. 4.